Ab15580 is batch tested in ICC/IHC. 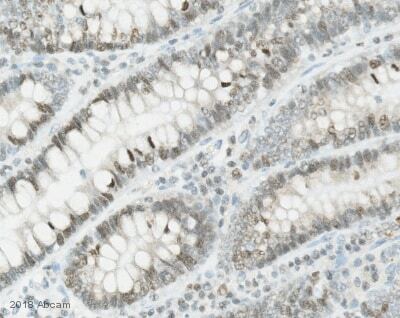 A variability in IHC-Fr can occur with this antibody but we can guarantee stability in IHC-P. Some customers have successfully used ab15580 in Western Blot. Higher molecular weight proteins like ki67 may be more difficult to detect in WB. We recommend several potential optimisation steps: loading higher amounts of protein (20 ug and above), using lower percentage gels and/or Tris-Acetate gels, increasing antioxidant to maintain protein reduction, decreasing methanol and increasing SDS in the transfer buffer and increasing time and voltage of transfer. Larger proteins can be subject to degradation more than smaller proteins so lower molecular weight bands may be present. For further information or support please contact our Scientific Support Team. Synthetic peptide conjugated to KLH derived from within residues 1200 - 1300 of Human Ki67. ICC/IF: Wildtype HAP1 cells; SK-N-SH cells; HeLa cells; MEF1 cells. IHC-P: Mouse and human spleen tissue; Human skin carcinoma tissue; Human colon tissue; Mouse tumour tissue; Human skin tissue. Our Abpromise guarantee covers the use of ab15580 in the following tested applications. IHC-P Use a concentration of 0.1 - 5 µg/ml. Perform heat mediated antigen retrieval before commencing with IHC staining protocol. ab15580 staining Ki67 in wild-type HAP1 cells (top panel) and Ki67 knockout HAP1 cells (bottom panel). The cells were fixed with 100% methanol (5min), permeabilized with 0.1% Triton X-100 for 5 minutes and then blocked with 1% BSA/10% normal goat serum/0.3M glycine in 0.1% PBS-Tween for 1h. The cells were then incubated with ab15580 at 1μg/ml concentration and ab195889 at 1/250 dilution (shown in pseudo colour red) overnight at +4°C, followed by a further incubation at room temperature for 1h with a goat anti-rabbit IgG Alexa Fluor® 488 (ab150081) at 2 μg/ml (shown in green). Nuclear DNA was labelled in blue with DAPI. 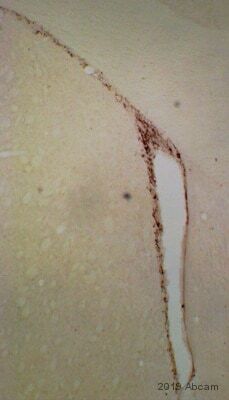 IHC image of ab15580 staining in mouse spleen formalin fixed paraffin embedded tissue section, performed on a Leica BondTM system using the standard protocol B. The section was pre-treated using heat mediated antigen retrieval with sodium citrate buffer (pH6) for 20 mins. The section was then incubated with ab15580, 5µg/ml, for 15 mins at room temperature. A goat anti-rabbit biotinylated secondary antibody was used to detect the primary, and visualized using an HRP conjugated ABC system. DAB was used as the chromogen. The section was then counterstained with haematoxylin and mounted with DPX. ab15580 staining Ki67 - Proliferation Marker in Human PBMCs by Flow Cytometry. Cells were isolated by Ficoll density separation, fixed in paraformaldehyde and permeabilized in 0.1% Saponin + PBS. The sample was incubated with the primary antibody (1/100 in PBS + 1% FCS and 0.09% sodium azide) for 1 hour at 4°C. A phycoerythrin-conjugated Goat anti-rabbit IgG (1/100) was used as the secondary antibody. 1 = isotype; 2 = PBMCs untreated; 3 = PBMCs treated with PHA. IHC image of Ki67 staining in human spleen formalin fixed paraffin embedded tissue section, performed on a Leica BondTM system using the standard protocol F. The section was pre-treated using heat mediated antigen retrieval with sodium citrate buffer (pH6) for 20 mins. The section was then incubated with ab15580, 1µg/ml, for 15 mins at room temperature and detected using an HRP conjugated compact polymer system. DAB was used as the chrogen. The section was then counterstained with haematoxylin and mounted with DPX. 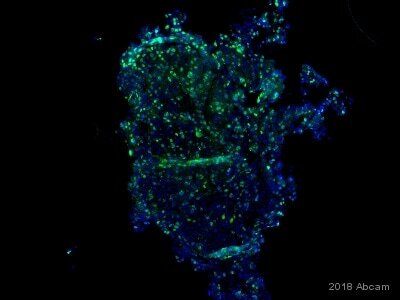 Fluorescent confocal microscopy (20x) of mouse (P0) olfactory bulb, outer glomeruli layer, showing Ki67 immunoreactivity (ab15580; 1/1000; overnight at RT, 0.25% TX-100 no blocking step) using a secondary goat anti-rabbit fluorescent antibody (Alexa Fluor 488;1/300 2h at RT. ab15580 staining Ki67 in SK-N-SH cells treated with NADA (N-Arachidonyldopamine) (ab120099), by ICC/IF. Decrease in Ki67 expression correlates with increased concentration of NADA (N-Arachidonyldopamine), as described in literature. The cells were incubated at 37°C for 10 minutes in media containing different concentrations of ab120099 (NADA (N-Arachidonyldopamine)) in ethanol, fixed with 4% formaldehyde for 10 minutes at room temperature and blocked with PBS containing 10% goat serum, 0.3 M glycine, 1% BSA and 0.1% tween for 2h at room temperature. 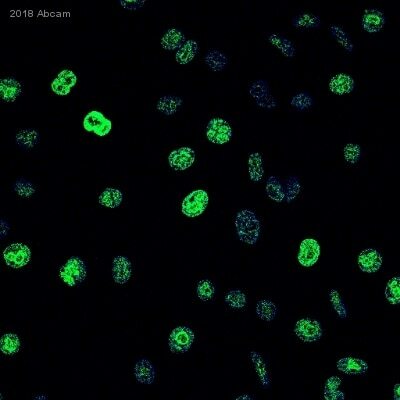 Staining of the treated cells with ab15580 (1 µg/ml) was performed overnight at 4°C in PBS containing 1% BSA and 0.1% tween. A goat anti-rabbit DyLight 488 secondary antibody (ab96899) at 1/250 dilution was used as the secondary antibody. Nuclei were counterstained with DAPI and are shown in blue. SK-N-SH cells were permitted to grow to confluency, then serum starved for 48 hours and predominantly driven into G0. The cells were then paraformaldehyde fixed and immunofluorescently labelled with anti-Ki67 (ab15580) at a dilution of 1/1000. The majority of the cells show little or no Ki67 staining, indicating they are in G0 arrest (red cells). 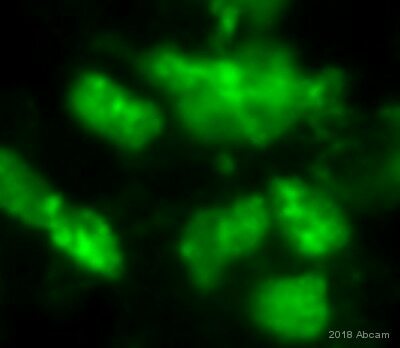 Two cells however show strong nucleolar Ki67 staining indicating they are still cycling (green cells). The DNA is stained with DAPI and is shown in red. The Ki67 staining is shown in green. x 63 magnification. Similar results were seen with an asynchronous population of HeLa cells. The Ki67 staining was localised to the periphery of the nucleoli and throughout the nucleoplasm of proliferating cells. (This data is not shown but is available upon request). ab15580 at 1/50 staining Human umbilical artery endothelial cells by ICC/IF. The tissue was paraformaldehyde fixed and blocked before permeabilization with saponin and incubation with the antibody for 16 hours. A FITC conjugated goat anti-rabbit IgG was used as the secondary. 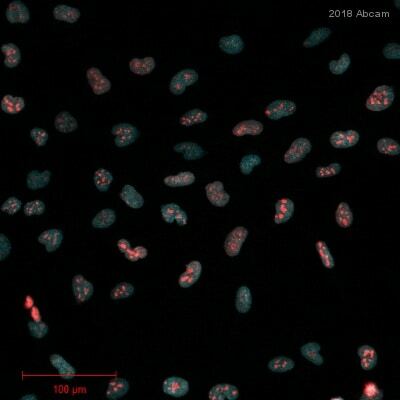 The merged image shows those cells expressing Ki67 from the total number of exponential cells. IHC image of ab15580 stained human skin carcinoma FFPE section. Section was pre-treated using pressure cooker heat mediated antigen retrieval with sodium citrate buffer (pH6) for 30 seconds at 125°C. Section was incubated with ab15580 at a dilution of 1:200 for 1h at room temperature and detected using an HRP conjugated polymer system. DAB was used as the chromogen. The section was then counterstained with haematoxylin and mounted with DPX. ab15580 staining Ki67-Proliferation Maker in human colon tissue sections by IHC-P (formaldehyde-fixed paraffin-embedded sections). Tissue samples were fixed with formaldehyde and blocked with 10% goat serum for 30 minutes at 25°C. Antigen retrieval was by heat mediation in Target Retrieval Solution. Samples were incubated with primary antibody 1/5000 (TBST) for 1 hour at 25°C. Immunohistochemistry analysis of Formaldehyde-fixed paraffin-embedded mouse tumour tissue sections labelling Ki67 with ab15580 at 1/2000. The secondary antibody was biotin conjugated goat polyclonal vector at a dilution of 1/250. 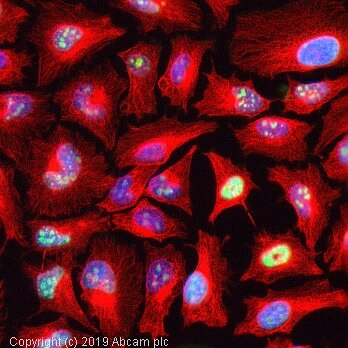 ab15580 staining Ki67 in HeLa cells. The cells were fixed with 4% formaldehyde (10 min), permeabilized with 0.1% Triton X-100 for 5 minutes and then blocked with 1% BSA/10% normal goat serum/0.3M glycine in 0.1% PBS-Tween for 1h. 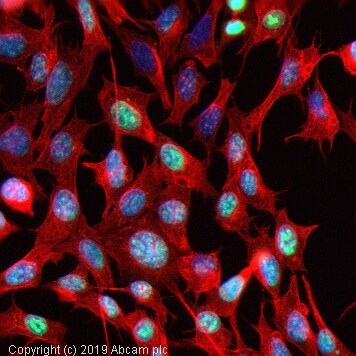 The cells were then incubated overnight at +4°C with ab15580 at 1ugml then detected with an Alexa Fluor® 488 goat anti-rabbit secondary antibody (ab150081) at a 1/1000 dilution (shown in green). Nuclear DNA was labelled with DAPI (shown in blue), and ab195889, Mouse monoclonal to alpha Tubulin (Alexa Fluor® 594), at a 1/250 dilution (shown in red). ab15580 staining Ki67 in MEF1 cells. The cells were fixed with 4% formaldehyde (10 min), permeabilized with 0.1% Triton X-100 for 5 minutes and then blocked with 1% BSA/10% normal goat serum/0.3M glycine in 0.1% PBS-Tween for 1h. 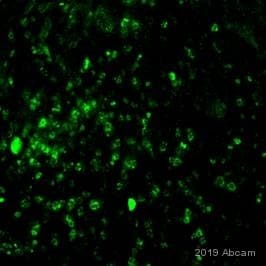 The cells were then incubated overnight at +4°C with ab15580 at 1ugml then detected with an Alexa Fluor® 488 goat anti-rabbit secondary antibody (ab150081) at a 1/1000 dilution (shown in green). Nuclear DNA was labelled with DAPI (shown in blue), and ab195889, Mouse monoclonal to alpha Tubulin (Alexa Fluor® 594), at a 1/250 dilution (shown in red). ab15580 staining Ki67 - Proliferation Marker in Human skin tissue sections by Immunohistochemistry (IHC-P - paraformaldehyde-fixed, paraffin-embedded sections). Tissue was fixed with paraformaldehyde and blocked with 4% serum for 30 minutes at 25°C; antigen retrieval was by heat mediation in a citrate buffer (pH 6.0). Samples were incubated with primary antibody (5 µg/ml in blocking buffer) for 16 hours at 4°C. A Texas Red ® Goat anti-rabbit IgG polyclonal (1/100) was used as the secondary antibody.